For those drum corps fans who also love the sound of brass ensembles in a theater setting, top ensembles will converge in the suburbs of Chicago this weekend for the U.S. Open Brass Band Championships on Saturday, Nov. 2. Organizers say the goal of the competition is to bring light to the brass band movement in North America, which has a strong following in the United Kingdom and other European countries. 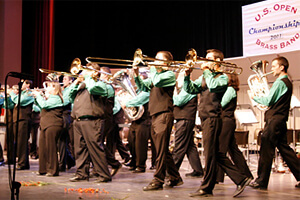 Ensembles are composed of standard brass band instrumentation, which includes cornets, tenor horns, baritones, euphoniums, tubas and percussion. Unlike traditional British contests that require each group to perform the same piece of music called a "test piece," the U.S. Open follows an "entertainment format" that allows ensembles to perform a 25-minute concert of music of their choosing. This year's event will attract brass ensembles from across the Midwest including Illinois, Iowa, Missouri, Ohio and Michigan. Performances begin at 9:30 a.m. CT at the Norris Cultural Arts Center (1040 Dunham Road, St. Charles, Ill.). $25 tickets can be purchased at the venue box office on the day of the event.